If you landed here without reading the first part of this article, you can do so at this location. Saturday night headliners IQ have the concert hall buzzing. 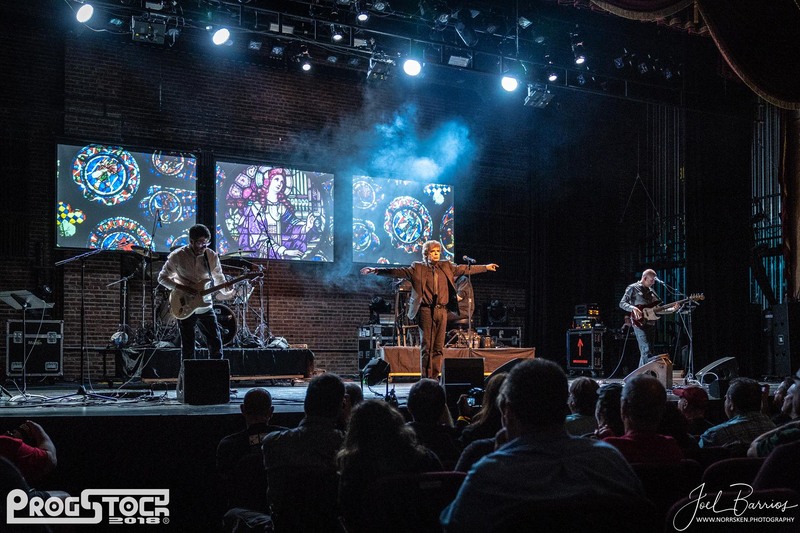 They play very infrequently in the States and for many of their long-time fans (some of whom have followed them since the early ’80’s), this might be their first chance to see the band live. Despite delays in starting time, they are received by a rapturous response as they open with “The Darkest Hour” from their 25-year-old album Ever. The setlist focuses on that album to celebrate its re-release, but IQ wisely chooses not to play the entire thing sequentially, instead peppering its tracks throughout the set. Recent release and fan favorite The Road of Bones gets a number of its moody, dramatic songs performed, as does previous album Frequency. Lead singer Peter Nichols is warm in his between-song banter, but during the band’s dark material his stare matches his piercing voice, bringing a subtly theatrical approach to his delivery. 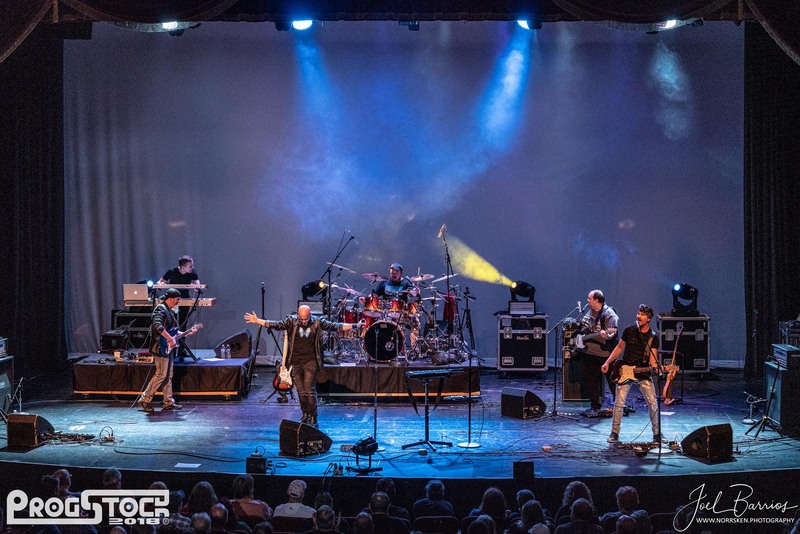 IQ have established a sustained potency throughout the decades, playing a handful of noteworthy shows each year while maintaining their diverse daytime careers, and releasing excellent new albums every three to four years. It’s an impressive trajectory for any band, and they have earned every standing ovation they receive throughout their performance. They have time to deliver two encore songs, exceeding the reported curfew of midnight, and as they close with “Widow’s Peak” the mood in the auditorium is triumphant. IQ have landed what for many will be one of the pinnacles of ProgStock. But the adventure continues! Just a block away, the late night sessions are already blazing forth with fantastic performances from two amazing quartets: Joe Deninzon’s Stratospheerius and Fernando Perdomo’s Out to Sea Band. The musicians in each band are phenomenal, and their sets are lively enough to keep the crowd engaged no matter how late it gets…up to 3AM and beyond! Deninzon and Perdomo also trade cameo’s in each other’s sets to add to the fun. Their mastery is evident as they each gleefully shred on the violin and guitar, respectively. In between, RobeOne (Robert Schindler) offers an engaging keyboard-driven solo set in the lobby, as IQ members continue their meet and greet down the hall with their fans. By the time they’ve met every fan, Peter Nichols exclaims his amazement at the fervor of those in attendance despite the late hour. The final day again starts with a local band. However, unlike the other days’ openers, IZZ have a long history and are fairly well known by the crowd who welcome them warmly at an early 11AM. Indeed, for many, this is one of the bands they have most been wanting to see, given IZZ ’ 20 year history. Led by John and Tom Galgano, the band’s sound is rich and full, with guitar, bass and keys solidly covered, two percussionists and also two supporting vocalists (Anmarie Byrnes and Laura Meade) who also have their own solo albums available. The band is able to play at least one song from each each of their recordings, including a brief excerpt from ELP’s “Take A Pebble”. 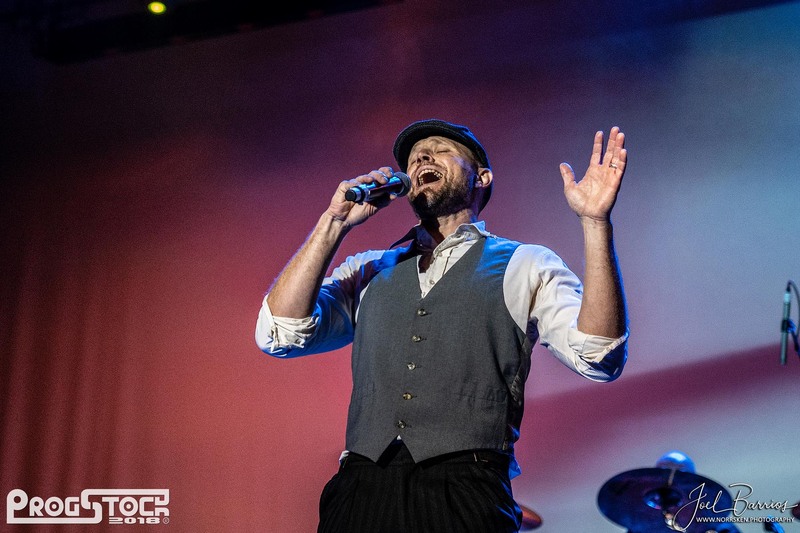 Alternating between all of their vocalists, IZZ bring a diverse set that is embraced by many who have been following this band for the past many years. It’s a very rewarding way to start the new day after such a long stream of engaging music on Saturday. There is much whispering going on throughout the crowd for upcoming band Evership. While many have not yet experienced this young band with a sole debut album to their name, those who have heard it are singing their praises loudly. As they come on stage, the entire audience understands why. Dressed in neat vest suits, the band has an image that demands attention but they also have a host of other attributes going for them: impressive compositional skills, professional delivery and musicianship, and an incredible lead vocalist. They launch into the first half of their album and start winning over the crowd through one beautiful composition after another. The melodies on “Evermore” are simply sublime, delivered with feeling by frontman Beau West. Evership sail somewhere between Elton John at his most progressive (e.g. Funeral for a Friend) and…well…the next band in the schedule, Mystery, among many other symphonic greats. They may not have perfected their stage show completely yet, as West’s constant pacing on stage distracts from his impressive vocal delivery, but give them time and this could be one of the best bands of the next decade. Their sophomore album is just getting its finishing touches, and we are treated to a long section of new music from it. They return to the debut album for a fine rendition of their mini-epic “Flying Machine”, closing to enthusiastic applause from the crowd. Sunday night headliner Eddie Jobson has added a curious afternoon offering before he returns later to close the night with his band playing the music of UK: he comes out solo at 4PM to lead a “Masterclass”. Although he has done this before on some of his tours, and it is not unusual for highly skilled musicians to offer “clinics” at music stores before an evening performance, no one quite knows what to expect with this taking place at a festival. Indeed, its foundational confusing nature plays out as one might guess: some of the audience opts to take a much needed break (read: nap) during two hours of down-time between musical acts, while those who do choose to attend have a mixed experience. After an unsatisfying foray of Q&A (always get the questions ahead of time if you want Q&A to be meaningful to a large crowd), Jobson essentially gives his take on a few aspects of music theory. It’s not quite as dry as it sounds, and he is playful in his explanation of themes like “resolution” and “modes”, sometimes demonstrating his point on the grand piano in front of him. But this kind of material being presented for a festival audience runs the risk of going over the heads of non-musicians, and being fairly obvious for the more schooled musicians. In other words, no one is taking away much of significance from this session, other than getting to spend some more intimate time with Jobson. Unfortunately, it also pushes the schedule further behind, which will ultimately have undesired consequences for Jobson’s headline set. Back to the music! 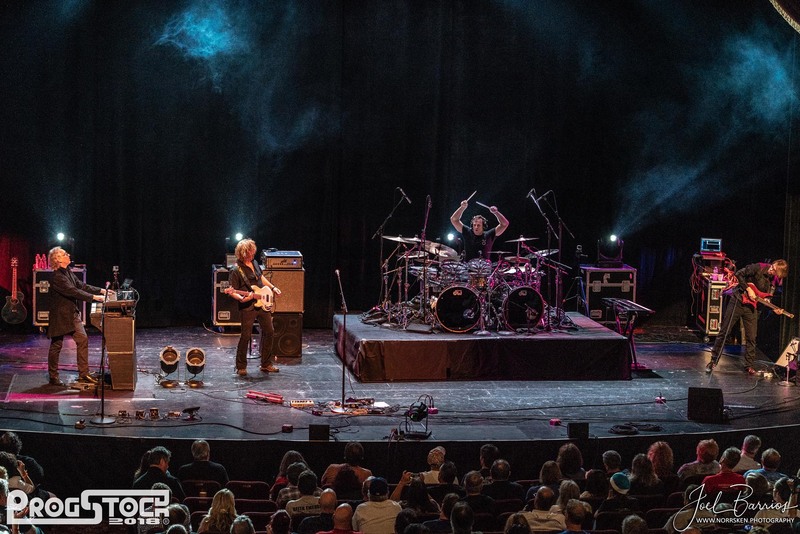 Although they are based in Canada, long-time proggers Mystery have seldom played in the States, which makes their appearance at ProgStock extra special. They are about to unleash one of the top performances of the weekend and for some fans, the highlight set of the entire festival. A few years ago, Mystery’s lead singer Benoit David (who also performed with Yes) left the band, and for over a year it was uncertain if they would even continue. Enter new frontman Jean Pageau. Two studio albums later, the band is on fire and their live performance is seamless, rivaling even the veteran acts like Enchant and IQ. The musicians are having a great time, projecting an aura of joy and love which envelops the audience. It’s contagious, thanks largely to the energy bouncing off of Pageau whose powerful voice is easily one of the finest we have heard. Fueled by an unbeatable rhythm section of drummer Jean-Sébastien Goyette and bassist François Fournier, the band also features two excellent guitarists (including founder and main songwriter Michel St-Père) and keys. They play their entire new album “Lies and Butterflies” throughout the set, along with many selections from their back catalog. Pageau has won the audience over, at times donning phantom costumes and at other times running out through the aisles of the crowd. They play a full two hours, including thirteen songs, before leaving the ProgStock stage with everyone on their feet cheering. The organizers of ProgStock were absolutely giddy in announcing the final headliner of the festival several months ago: Eddie Jobson plays the music of UK. And they were even more giddy when Jobson unveiled his band including the revered Thomas Lang on drums, Marc Bonilla on bass & vocals, and Alex Machacek on guitar. Annoyingly, audience and band alike have to wait interminably long for the set to begin due to stage setup delays. But when the lights do finally go down and the band takes the stage, the audience jumps to their feet and the anticipation in the room is palpable. Jobson has chosen his band members well, and as Bonilla starts singing “Danger Money” there is almost an audible gasp in the audience at how closely his voice resembles that of John Wetton. The crowd is hanging on every note and when Jobson introduces “In the Dead of Night” by saying “Here’s a song you’ll know,” someone yells back, “We know all of them!” The rest of the audience gives a knowing laugh, for it’s true. The set is made even more poignant by Jobson announcing halfway through that this “might well be” his last performance. He gives a brief explanation that he has had a very satisfying musical career but that he is ready to move on. We are suddenly thrust into the realization that ProgStock is very fortunate to be witnessing this historic farewell. The band barrels through the UK repertoire with nary a note missed, Jobson at times switching from keys to play his signature translucent violins which are literally glowing from the well-placed stage lights. Lang gets a well-deserved drum solo half-way through the set, and his kit seems to have been welded to its drum riser to withstand his powerful style of playing. Machacek and Bonilla are delivering the goods for their respective parts, playing with ease and grace. One of the most emotional moments comes when Jobson and Bonilla perform a duet in honor of those passed, most notably Keith Emerson, in the form of ELP’s “Trilogy”. Sadly, the ending of the show is anticlimactic: the band have one or two more songs to play as an encore, but we have just passed over the midnight hour and the police are literally shutting the festival down! It would be an epic way to close an epic weekend, were it not so tragic that Jobson doesn’t get to finish his (perhaps) final concert the way he intended. Nevertheless, the band and audience are good sports, and fans are still able to lineup for a final meet and greet which will go late into the evening. Considering it’s only in its second year, ProgStock is doing a commendable job at creating something special and unique in the world of festivals: featuring a significant number of unique collaborations and interweaving of performers throughout the weekend which truly lends a feeling of “only-at-ProgStock”. Sadler with Flowers, Kerzner and Perdomo with Sadler, Jobson’s hand-picked musicians for his set, Keegan with Enchant, Sadler with Brislin — these are performances that you won’t see anywhere else. Add to that an outstanding array of bands who seldom play in the States (IQ, Mystery, Accordo), and introducing many newcomers to the scene, and we have an amazing weekend of music. Although it wasn’t perfect – the schedule was riddled with stage delays, the raffle on Sunday went on much too long considering the late schedule, and some of the sound engineering could have been improved – it was genuine, sincere and well-booked with its chosen performances. ProgStock 2019 is already being planned and will include Discipline, IO Earth and The Cyberiam with the rest of the roster to be announced. 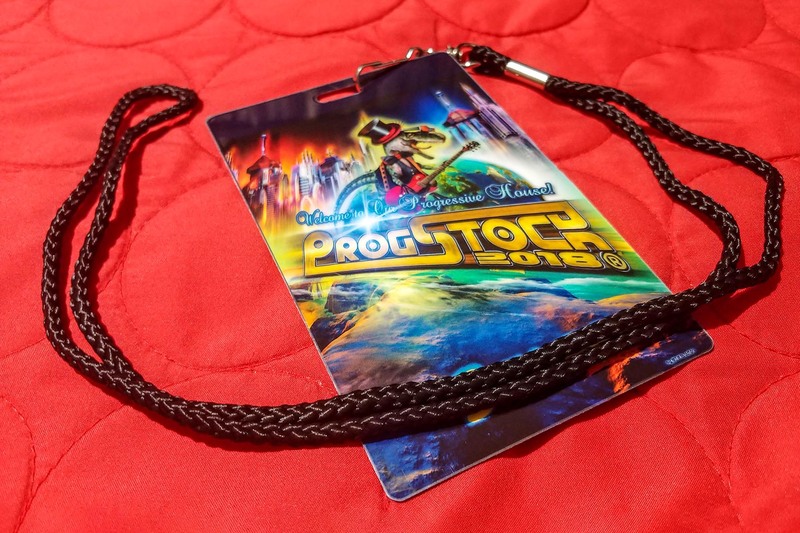 After a good long rest, the organizers will undoubtedly be looking how to make ProgStock even better for next year, and the crowd will be waiting. Bravo!